View from the top of St.Peters cathedral, the monumental centre of the Vatican, Rome, Italy. During the late afternoon hours the city is bathed in a wonderful soft light and on a clear day the view goes as far as to the Mediterranean Sea some 30 kilometres away. Aerial view of the City of Rome from the St Peter's Cathedral in Vatican City, Rome, Italy, Europe. 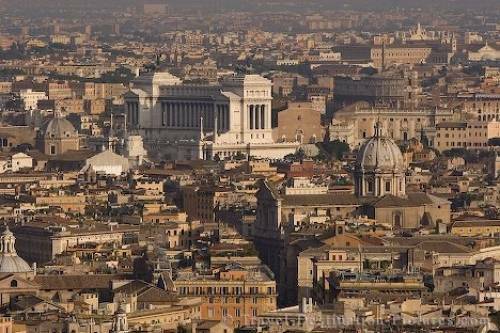 Aerial picture of the view of Rome from atop St Peter Basilica in the Vatican, Italy, Europe.